welsh rugby shirts for the kids. 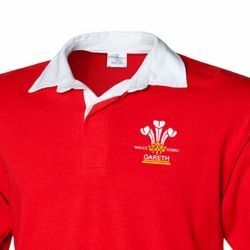 Our range of 3 feathers welsh rugby shirts for kids with the added option of opting for a personalised welsh rugby shirt. 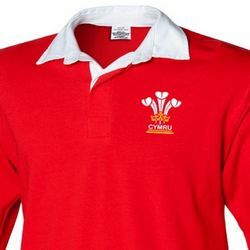 Our traditional welsh rugby jerseys are made from 100% preshrunk heavyweight Cotton and are heavyweight enough to withstand the rigors of international match day. The Three feathers desing is placed on the left chest with a small dragon power logo located at the neck on the rear of the garment. 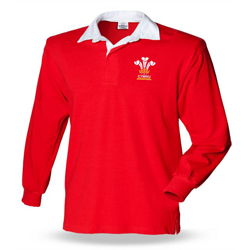 Please view the individual product pages for size guides to enable you to decide what size would be the best fit for your welsh rugby jersey.